"Major Todd Meyers with the Air Force ROTC Program and Detachment 345 will be visiting BHS on Wednesday, November 9th at 10:00 (period 6 that day). He is based out of the University of Massachusetts-Lowell while supporting Merrimack College, Rivier University, Middlesex Community College (CC), Northern Essex CC, and formerly Daniel-Webster College. He has offered to talk with any interested students about the Air Force. The UMass – Lowell Detachment is fortunate to have Mr. Gregory Forti (Burlington HS Graduate) in his Second Year of the Program. Since AFROTC is offered at more than 1,100+ colleges/universities nation-wide, he can explain the program and potentially put the prospective college student in contact with the host Detachment. See below for further details about the AFROTC Program and scholarship opportunities. Students interested in attending this information session should sign up in advance by putting their name on a sign-up sheet on the Guidance Counter. They will then receive a pass that will need to be signed by their period 6 teacher giving them permission to attend the presentation. The Guidance Department will host a breakfast called “College Topics for Senior Parents”. The purpose of this breakfast is so the counseling staff can give a very brief overview of important tasks associated with the college selection and application process. This event is geared for parents that missed the Senior College Planning Night on 10/6/16. Please join us for this informative event on October 26th at 8:30 AM in the BHS Guidance College and Career Center. Parent's MUST RSVP by calling 781-270-1780. Senior College Planning Night was well attended with roughly 125 parents. The BHS Guidance staff covered many aspects of the college planning and application process were covered. For parents that missed the event, BCAT will stream the event within the next few weeks. Informational packets were distributed to all that attended. If you would like to pick up a packet please feel free to stop by the Guidance Office. Also for parents that missed this event we will hold our annual "College Topics for Parents of Seniors" breakfast on October 26th at 8:30 AM in the BHS Guidance College and Career Center. 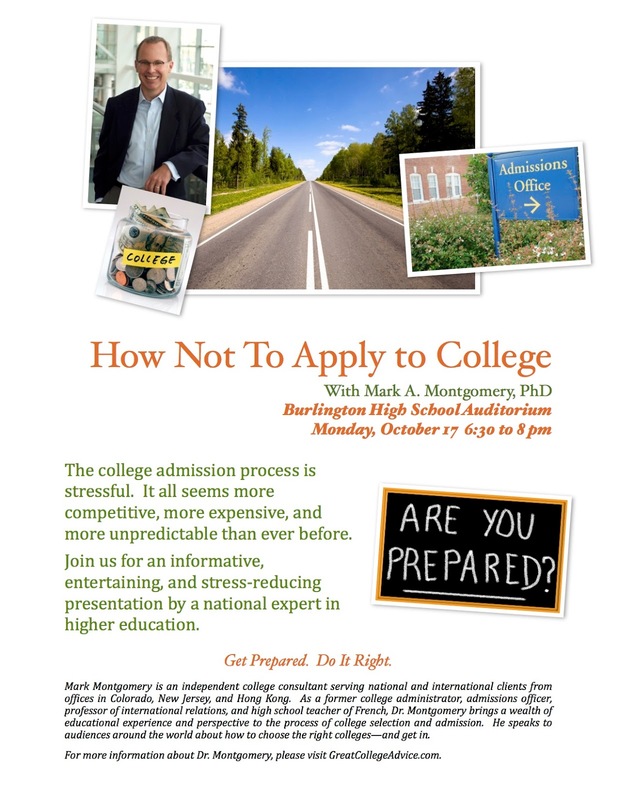 This informative event will cover the various topics relating to the college selection and application process for parents of Burlington High School seniors. In terms of financial aid, two very important forms were mentioned last night. The FAFSA and the CSS profile. Both forms are now available. We encourage parents to investigate both applications ASAP. Please remember that the BHS Guidance Department will host a Financial Aid Night on Thursday October 13, 2016 at 6:30, Thursday January 5, 2017 at 6:30 and BHS will be a location this year for FAFSA Day on January 29th. The BHS Guidance Department strongly recommends that senior parents attend a presentation on Thursday, October 13th, 2016 beginning at 6:30 PM in the BHS Auditorium. MEFA will host and give an overview of the financial aid process, specifically in regard to completing the FAFSA. The FAFSA is an on-line form that must be completed for seniors to be eligible for state and federal loans and grants (https://fafsa.gov/). This form is NOW available. Below are specific details about FAFSA changes. The New England Service Academy Information night will be at the Danversport Yacht Club on 11/2/2016. The event begins with dinner at 5:00. Film production, and other related disciplines. Students will have the opportunity to speak with representatives from colleges, universities, conservatories, festivals, and other educational institutions with specialized programs in the visual and performing arts. Attendees of these free events will learn about educational opportunities, admission and financial aid, portfolio days, auditions and entrance requirements, and much more. A workshop on Navigating the Audition/Portfolio Process will be offered from 6:10 p.m to 6:50 p.m at the College of Fine Arts - Theatre Lab. All participants are encouraged to register prior to attending this event. This will make navigating the fair and collecting information from multiple colleges and universities much easier. By registering, students can print a bar coded confirmation to be used on-site at the fair as an electronic ID. Register prior to attending these events HERE.